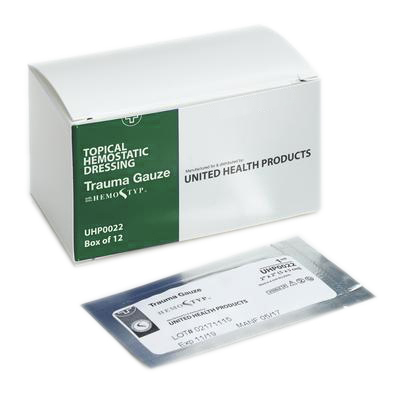 Surgical Products — United Health Products, Inc.
HemoStyp Trauma Gauze™ is available in 4' and 12' rolls and z-folds. Intended for severe trauma, including battlefield or veterinary applications, for wounds that must be wrapped or packed. Indicated for temporary external control of traumatic bleeding. Soft and flexible, easily conforms to the wound. Individually packaged in a foil pouch. HemoStyp® Trauma Gauze is specially formulated, bio-absorbable gauze that will produce hemostasis in seconds when applied to an open wound. HemoStyp readily conforms to the wound and is safe, effective and easy to use. HemoStyp is a biocompatible hemostatic gauze product formed from cellulose; one of the most abundant organic compounds on earth. 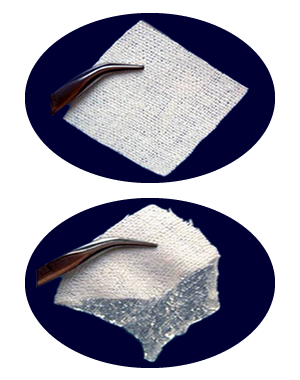 Once HemoStyp has dissolved in the wound, it can be removed with water or saline or left in place to be absorbed; prevents re-opening of the wound typically associated with other gauze products. Registered with the FDA to help control bleeding from open wounds and body cavities. OTC: HemoStyp® is indicated for temporary external topical bleeding of minor cuts or lacerations. • Cut or fold the gauze to best cover the wound site. • When bleeding has stopped; add water to dissolve the gauze. • When the gauze has transformed, just wipe the residue away from the bleeding site.